Advanced Repair and Optimization is a full-fledged PC maintenance and optimization suite that allows you to clean useless clutter, optimize settings and other useful actions that lead to increased system performance. - Scanner engine analyzes registry, junk files and security status offering cleanup and detailed information about discovered issues. - Performs registry tweaks in 13 critical Windows registry areas to optimize NTFS performance, OS kernel performance, increase processor priority and maximum threads and increase the speed of Windows startup. - Scans and cleans junk file such as recent documents, shortcuts, memory dumps, temporary files, Windows log files…etc. 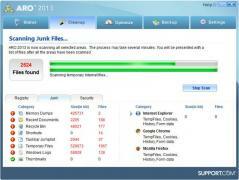 - Deletes browser junk data, like internet cache, cookies, form data and browsing history. - Automated logging of all events and actions. - Backup and undo function.